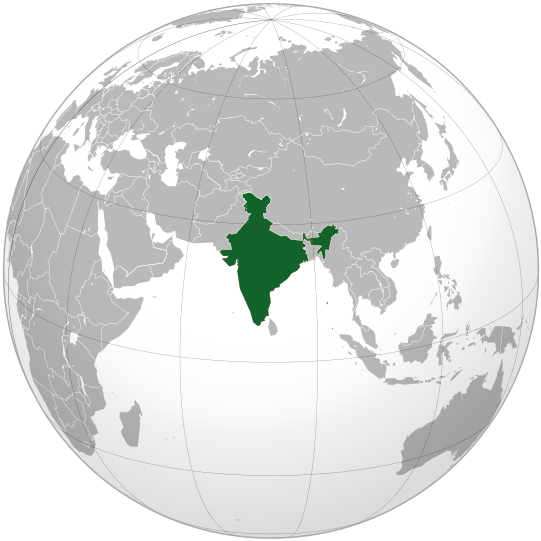 » India, officially the Republic of India (Bhārat Gaṇarājya), is a country in South Asia. » It is the seventh-largest country by area, the second-most populous country with over 1.2 billion people, and the most populous democracy in the world. » Bounded by the Indian Ocean on the south, the Arabian Sea on the south-west, and the Bay of Bengal on the south-east. » India accounts for 2.4 percent of the world's land surface area. » It shares land borders with Pakistan to the west; Afghanistan in west-north; China, Nepal, and Bhutan to the north-east; and Burma and Bangladesh to the east. » In the Indian Ocean, India is in the vicinity of Sri Lanka and the Maldives; in addition, India's Andaman and Nicobar Islands share a maritime border with Thailand and Indonesia. "I Bow to Thee, Mother"
ØIndia never invaded any country in her last 100000 years of history. ØChess was invented in India. ØAlgebra, Trigonometry and Calculus are studies, which originated in India. ØThe 'Place Value System' and the 'Decimal System' were developed in India in 100 B.C. ØIndia is the largest democracy in the world, the 7th largest Country in the world, and one of the most ancient civilizations. ØThe game of Snakes & Ladders was created by the 13th century poet saint Gyandev. It was originally called 'Mokshapat'. ØThe world's highest cricket ground is in Chail, Himachal Pradesh. Built in 1893 after leveling a hilltop, this cricket pitch is 2444 meters above sea level. ØIndia has the largest number of Post Offices in the world. ØThe world's first university was established in Takshila in 700 BC. More than 10,500 students from all over the world studied more than 60 subjects. The University of Nalanda built in the 4th century was one of the greatest achievements of ancient India in the field of education. ØAyurveda is the earliest school of medicine known to mankind. The Father of Medicine, Charaka, consolidated Ayurveda 2500 years ago. ØThe Baily Bridge is the highest bridge in the world. It is located in the Ladakh valley between the Dras and Suru rivers in the Himalayan mountains. It was built by the Indian Army in August 1982. ØIslam is India's and the world's second largest religion. ØThere are 300,000 active mosques in India, more than in any other country, including the Muslim world. ØThe oldest European church and synagogue in India are in the city of Cochin. They were built in 1503 and 1568 respectively. ØYoga has its origins in India and has existed for over 5,000 years. 21st June is celebrated as International Day of Yoga.